AFGHAN CANDIDATE FOR PARLIAMENT THREATENS AMERICANS WORLDWIDE IF KORAN-B-QUE TAKES PLACE……. – The Tundra Tabloids……. AFGHAN CANDIDATE FOR PARLIAMENT THREATENS AMERICANS WORLDWIDE IF KORAN-B-QUE TAKES PLACE……. “Michelle Malkin: Koran-burning isn’t the real “provocation.” Or Mohammed cartoons. As I’ve said many times over the years, the mere existence of infidels is what provokes and inflames the Religion of Perpetual Outrage. Retaliating against Koran-burners or targeting cartoonists is a lingering pretext to demonstrate that centuries-old, Koran-inspired hatred. If it isn’t cartoons, it’s always something else. From fresco rage to book rage to film rage to beauty pageant rage toKoran-dropping rage to cartoon rage to Pope rage, to ceramic Mohammed bobblehead rage to teddy bear rage to Burger King ice cream cone rage to blasphemous soccer ball rage, it never ends. 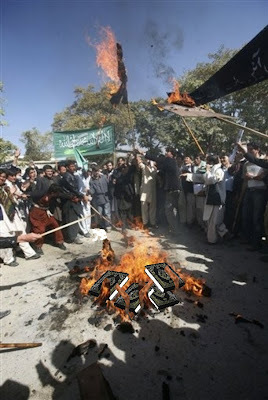 Previous Post Previous Post NOW THE KORAN-B-Q IS IN QUESTION……. Next Post Next Post MEDIA STARTING TO COWTOW TO FUNDAMENTAL ISLAM: AL-AP NOT DISTRIBUTING PICS OF BURNING KORANS…….